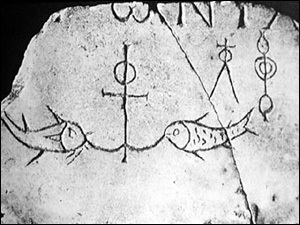 Anchor and fish, tomb slab from Catacomb of Domitilla, Rome, 3rd century A.D. A combination of a cross and an anchor, emblematic of faith and hope, was often used as a sacred symbol in the catacombs. Subjective. The effect of the cross on the sinner. Objective. What the atonement achieves quite outside the individual. These are over simplifications of the various theories, but enough to give you the gist of the argument. Moral Influence Theory. Describes the subjective effects of Christ's cross on the sinner. Abelard teaches that when we look at the cross we see the greatness of divine love, which delivers us from fear and produces in us an answering love, putting aside selfishness and sin. Popular among scholars in the liberal school. Atonement as Victory. Sees sinful people as belonging to Satan. God offers his Son to Satan as a ransom, but Christ cannot be held in hell and rises the third day in victory. Popular with the early church fathers. A great 5-week Bible study for the Lent or Easter season, Lamb of God, available as a paperback, e-book, and/or DVD for small group teaching and discussion. Anselm's Satisfaction Theory. Sin dishonors the majesty of a sovereign God. To offer appropriate satisfaction to the offense would require one as great as God himself, but must be offered by a one who is man. Thus the God-man is needed to provide full satisfaction for sin. Penal Substitution. The wages of man's sin is death. Christ endures death and God's punishment for sin in our stead. Popular with the Reformers. Sacrifice. Christ's saving act is a sacrifice for sin. Governmental Theory. Grotius argues that Christ did not bear our punishment, but suffered as a penal example whereby the law is honored while sinners are pardoned. Which of these is true? All have elements of truth in them but some are inadequate to stand alone. A better question may be: Which are clearly supported in the Bible? I'm not trying to promote a particular theory but stimulate you to thoughtfully examine what the Bible actually teaches. References: Leon Morris, "Atonement, Theories of the," in Walter A. Elwell (ed. ), Evangelical Dictionary of Theology (Baker, 1984), pp. 100-102. Geoffrey W. Bromiley, "Atone," International Standard Biblical Encyclopedia 1:352-360. C.M. Tuckett, "Atonement in the NT," Anchor Bible Dictionary 1:518-522. Wayne Grudem, Systematic Theology (Zondervan, 1994, 2000), pp. 579-582, 586.